Rooted in Bangalore, Songs of Summer, Garden Store and Pottery Studio, was created with a love for customizing green concept products and spaces. Our products and Services include:Retail of Ceramic garden products,Customized green Gifts for events and corporate orders and Turnkey Garden Design for balconies, patios and terraces. The limited edition Songs of Summer are a fun and quirky line of handcrafted garden products and accessories in stoneware. We stand for dynamic design ideas, crafted with an eye for detail.We design & develop ceramics for Customized gifting, institutional events - corp-orates & personal occasions.Landscape design for - Residential spaces, Commercial spaces. We conduct Pottery workshops and events and teach pottery enthusiast the basics of pottery. You can contact us through our website for further details. 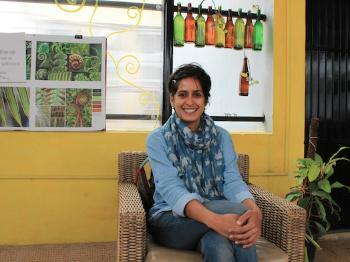 Puja Rao  founded Songs of Summer- a garden store and pottery studio, based in Bangalore in 2010. A Fashion designer from NIFT, mumbai she has over a decade of experience as an apparel and product designer. A self taught studio potter, our endevour has been to create a mix of playful experiential products, where art meets design. Each piece is designed and handcrafted in-house together with her assistant potter Saumya Kapoor , where they explore fine details through experimentation of techniques that create a story woven into its visual treat for the observer.The happiness in the evolution of each product ,from a thought to its basic inanimate state- full of possibilities, to the finished form is what is a source of great motivation to continue the exploration and evolution of us as individuals, artists and designers. Songs of Summer is committed to deliver your order with good quality packaging within given time frame. We ship throughout the week, except Sunday, monday & Public holidays. To ensure that your order reaches you in good condition, in the shortest span of time, we ship through reputed courier agencies only. If there is no courier service available in your area, we will ship your items via Government Registered Bookpost or Speedpost which at times may impact the delivery duration. Songs of Summer believes in helping its customers as far as possible, and has therefore a fair cancellation policy. Songs of Summer products are largely handcrafted, thus creating light variations from piece to piece in size, shape, colour and finish, these conditions will not be considered under return/exchange policy. our return policy only covers damaged and broken goods. How do I cancel an order on Songs of Summer? "Please keep in mind that items may appear larger or smaller in listing photographs than they actually are. Remember to look at the measurements that are mentioned in each item’s description."